This new EU legislation applies to all companies in the world that are processing the personal data of data subjects residing in the European Union, regardless of the company’s location. Meaning to say that even businesses outside of the EU that are offering goods or services to anyone living within the EU will also need to ensure they're compliant with the new rules & regulations, as they could also be subject to hefty fines of European Authorities/ Data Protection Authorities up to €20 Million or 4% of the annual global turnover or (whichever is greater). As a lot of the businesses on our island are dealing with EU customers – one may think of the residents of Saint Martin (Fr.) & the Netherlands -, we believe that it’s important to create more awareness about this new legislation. We would therefore like to invite you to an info session and Q & A on the GDPR. 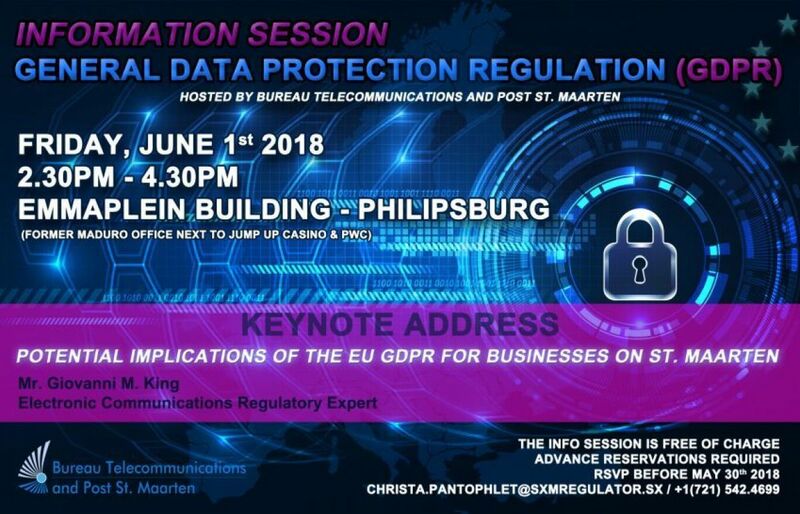 We will provide more information on the potential implications of the EU GDPR for businesses on St. Maarten. Please RSVP by christa.pantophlet@sxmregulator.sx before June 1st 2018.